Iraqi forces were under attack when the Canadian pulled the trigger (file photo). 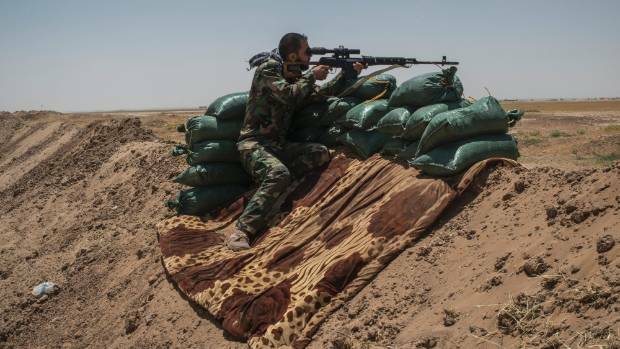 A Canadian sniper has reportedly killed an Islamic State fighter in Iraq with a bullet fired more than 3 kilometres away. It's a shot that has stunned the military world, and, if confirmed, would shatter the current world record for a kill shot in military combat by almost a kilometre. A member of Canada's Joint Task Force 2 shot the "insurgent" from a distance of 3450 metres during an operation in the past month, The Globe and Mail reports. The shot was fired from a McMillan TAC-50 sniper rifle from a high-rise building in the area and required the sniper to take into account not only wind and distance, but also the curvature of the Earth. It took just less than 10 seconds to hit its target. The shot, verified by video, disrupted an IS attack on Iraqi security forces and was considered appropriate given the situation, multiple sources told The Globe and Mail. The world record was previously held by British sniper Craig Harrison. He shot a Taliban gunner with a 338 Lapua Magnum rifle from 2475 metres away in 2009. A military insider told The Globe and Mail: "This is an incredible feat. It is a world record that might never be equalled." The sniper's name and location weren't released for operational reasons. Ten seconds flight time. Impressive. How many clicks of up? veitnamcam, 199p, Munsey and 3 others like this. veitnamcam, tetawa, ebf and 3 others like this. Ha Ha yeah. In Canada it is Noofy jokes like Irish ones here. Ryan and WallyR like this. As impressive as it may be from a technical/ballistic standpoint, I don't understand why such details should be released and/or championed. At the end of the day, they're humans being killed (not paper targets). If a military force feels obligated to decimate certain individuals for the wellbeing of its troops and or to fulfill a necessary political objective (debatable), it should do so quietly, efficiently and without glamorizing it. I get the point of the thread, and it's a heck of a shot, but that's the way I see it anyway. nor-west, kiwijames, BRADS and 5 others like this. I don't understand why mass murders perpetrated by ISIS, Islamist radicals in France, Belgium, Germany, Russia etc etc. receive media attention either but I'm sure glad that some of those people (and I use the word "people" in the loosest possible sense) are able to be dispatched in a manner which is clinical and reduces / eliminates the risk of collateral damage / killing innocents associated with other types of force. It is a tremendous feat of arms that should be acknowledged for the skill and discipline required to administer it. Gapped axe, mikee, Koshogi and 5 others like this. Take it from an old soldier Frodo and in my case especially. I most certainly would not hold any of these insurgents in any higher regard than a paper target. And quite frankly it would be a dysfunctional/ineffective soldier that would. As for the military championing the action I fully support it. It builds moral for the grunts that have to do the hard yards knowing someone with those skills is watching over them allowing them to concentrate on their tasks. What the media does with the information is up to them. wsm junkie, von tempsky fan, Gapped axe and 7 others like this.